The separatist rebels of eastern Ukraine and the government in Kiev that controls the Ukrainian army have reached a cease-fire in place that leaves the separatists largely in control of the Russian-majority regions of the eastern part of that country. The agreement to stop the fighting was reached at negotiations organized and led by Russia and held in Minsk, the capital of Belarus. It was reached at the same time that the US was pressing leaders of the NATO countries, at a meeting in Wales, to boost their military spending and to set up more offensive military positions in countries bordering Russia. The one thing that did not happen as a result of the cease-fire, and that in fact never even got addressed in the Minsk talks, was a withdrawal of Russian troops from eastern Ukraine. There was no withdrawal or even mention of those troops -- said to number about 1000 by the US and the Kiev government -- because there never were Russian troops invading Ukraine. As both Russian President Vladimir Putin and Aleksandr Zakharchenko, the head of the self-proclaimed Donetsk People's Republic have, quite logically, pointed out, if Russia had invaded eastern Ukraine, it would not have done so by just secretly slipping in 1000 troops. It would have gone in with all 20,000 of the heavily armed troops it has reportedly massed on the Russian side of the border with Ukraine, and with its overwhelming air power, and by now would be threatening Ukraine's capital of Kiev. The Pentagon knows this. The CIA knows it. The State Department knows it. Anyone who's watched the Russians in prior military actions (Afghanistan, Hungary, Czechoslovakia, etc.) knows it. Never mind, President Obama continues talking ominously and speciously about a Russian invasion. 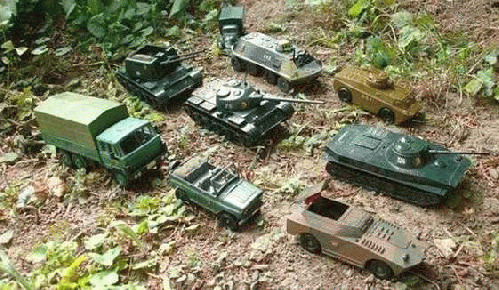 But as I learned when I wrote a spoof piece about that "invasion" a few days ago and tried to find some photos of Russian soldiers or Russian weapons in Ukraine on-line to go with it, there is absolutely no photographic evidence of such an attack.